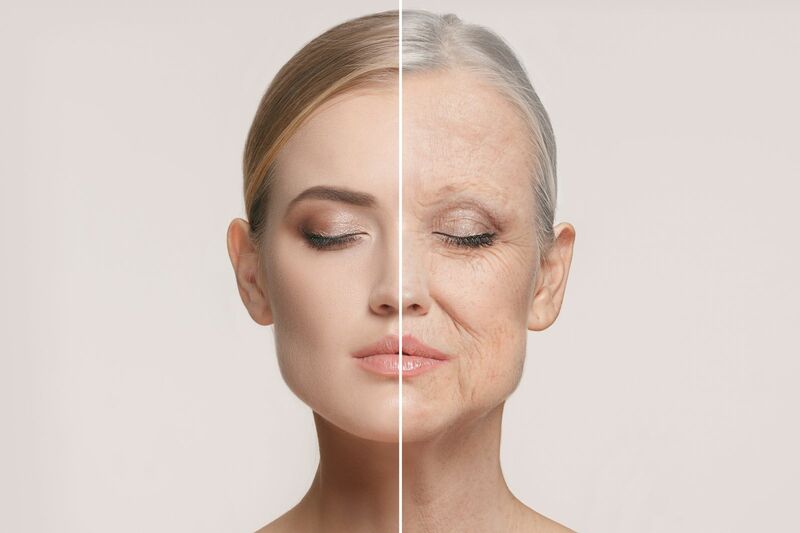 A gracefully aging face is a beautiful thing, but there are changes that occur with age that we would like to slow down. Age affects every nook and cranny of the body. Along with the wisdom, experience, and accomplishments that come with getting older, there are changes that occur in our outward appearance. Changes in our faces are most at the forefront. Tips of noses may droop because connective tissue supporting nasal cartilage weakens. There are also structural rearrangements going on behind the scenes. When we're young, fat in the face is evenly distributed, with some pockets here and there that plump up the forehead, temples, cheeks, and areas around the eyes and mouth. With age, that fat loses volume, clumps up, and shifts downward, so features that were formerly round may sink, and skin that was smooth and tight gets loose and sags. Meanwhile other parts of the face gain fat, particularly the lower half, so we tend to get baggy around the chin and jowly in the neck. And, of course, there are the wrinkles. Those deep ones in the forehead and between the eyebrows are called expression, or animation, lines. They're the result of facial muscles continually tugging on, and eventually creasing, the skin. Other folds may get deeper because of the way fat decreases and moves around. Finer wrinkles are due to sun damage, smoking, and natural degeneration of elements of the skin that keep it thick and supple. What can I do about my aging face? Even if you have great genes and look much younger than you are, age-related changes in our facial appearance are unavoidable. Those changes reflect our joys and challenges in life. One approach is to simply celebrate our age and appearance for what they are. Not everyone is comfortable with that, and some might like to postpone embracing those changes. The age-defying facelift, which surgically removes excess tissue and lifts sagging skin in the lower part of the face, is one way to try to stem the tides of time. Facelifts have improved, so the results tend to look more natural. But the surgery is expensive (the surgeon's fee alone is just under $7,000, on average), and other procedures may be needed to achieve the desired results. The facelift procedure is only the 20th most popular cosmetic procedure, and now there are plenty of alternatives for altering the aging face. Although most of these rejuvenating procedures are nonsurgical, they're not inexpensive — especially when you factor in the need for repeat treatments. Sun protection. Protecting your face from the sun is the single best way of keeping it youthful. Much of the damage comes from the UVA part of the light spectrum, so you need to put on sunscreen that protects against it and UVB light, which causes sunburn. Wearing a wide-brimmed hat is also a good idea. Creams and lotions. Moisturizers soothe dry skin and may temporarily make wrinkles less noticeable. Moisturizers for the face contain water to make them less greasy, and many have substances — glycerin, for example — that may help bind water to the skin. Exfoliant creams can improve the appearance of older skin by getting rid of dead skin cells that don't slough off as readily as they did when we were young. Several prescription creams (Avita, Avage, Renova, Retin-A) have been shown to reduce wrinkles and so-called liver spots caused by sun exposure. These FDA-approved creams contain retinoids, compounds related to vitamin A that seem to work by inducing collagen production in the dermis and altering melanin, the pigment that causes liver spots. There are several varieties of retinoids. Tazarotene and tretinoin are the ones used in the FDA-approved products. Botulinum toxin injections. These injections are used to treat the expression lines of the forehead and between the brows. They work by partially immobilizing the muscles that form expression lines so the skin smoothes out, although some deep expression lines may not go away. Botox is the familiar brand name. Other FDA-approved botulinum toxins are Myobloc and Dysport. Dermal fillers. Dermal fillers are used to treat lines created by lost collagen and fat. After botulinum toxin injections, dermal filler injections are the most common cosmetic procedure performed in the United States. Prime locations for the injections are two sets of parentheses: the pair of lines that extend down from the nose to the corners of the mouth, known as the nasolabial folds, and another pair that extends down from the corners of the mouth to the chin, known as marionette lines. Many different materials are used as dermal filler. Collagen has fallen out of favor. Currently, the most popular one is hyaluronic acid, a complex sugar found naturally in many tissues. Hyaluronic acid is more expensive than collagen, but lasts longer — up to six months in the nasolabial folds. Like botulinum toxin injections, the effect of the dermal filler shots wears off after several months — how long depends on the injection site — but with repeat injections it seems to last a little longer. Laser treatments. Lasers can be used to home in on certain pigments: brown, if the goal is to get rid of freckles and liver spots, red if the target is broken capillaries. They're also used for wholesale resurfacing of facial skin. The uppermost layers are stripped away, and with them, wrinkles from sun damage and scars from acne. The energy from some "nonablative" resurfacing lasers passes through the outer layer of the skin to work at a deeper level, in the dermis, to stimulate inflammation, which leads to collagen formation. Skin needs time to recover after most laser treatments. It can take a couple of weeks to heal, depending on the type and extent of the treatment. The nonablative treatments tend to heal a bit faster.